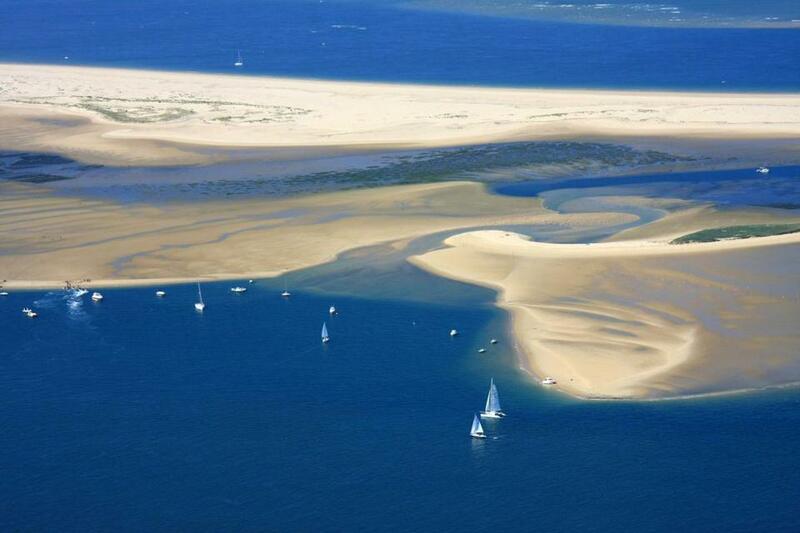 The Arguin sandbar at the foot of the Dune of Pilat, Europe’s highest sand dune. CAP FERRET — What is it about this windswept spit of pine-studded sand on the coast near Bordeaux that keeps drawing me back? There’s nothing much to do here. No must-see museums, no happening hot spots, no distinctive shopping. Just a narrow, 15-mile-long cape, anchored by this speck of a village that hovers between bay and ocean. Yet as soon as I hit the lone, two-lane road toward the point, I’m done for, immersed in a state of “luxe, calme, and volupté,” to steal Matisse’s words. My heart beats slower. My eyes relax, soothed by a tapestry of weathered hues: dun, sage, taupe, pewter. My ears switch to vacation mode, lulled by birdcalls and the vast bay’s tidal rhythm. Over the years I’ve learned that if I want to stir myself, I can bike the 45-mile-long trail that links the villages and towns along “le Bassin” (as the French call Arcachon Bay) or hike the network of footpaths through dense forest and fishing villages or even take lessons at the local surfing school on the wild Atlantic side. But for me, the real enchantment here is all about oysters, slurped raw with a spritz of lemon juice and chased with a fat glass of crisp local white wine. I feast by a shorefront oyster shack owned by one of the 315-some family affairs whose oyster beds pepper the bay, taking in the massive Dune du Pilat across the water, rosy in the setting sun. My husband, Guy, whose family roots run deep in Bordeaux, introduced me to Arcachon Bay (and raw oysters) 16 years ago. Like many Europeans, he was itching to scale the bay-front Pilat Dune, the highest sand dune in Europe at 350 feet. I remember a November visit, the dune a snowy white mountain, pearly blue water lapping at its base. Except for the cool weather, I felt like I was on some tropical island. Until it was time for lunch. “We must have oysters,” Guy said, scouting anxiously for a waterfront bistro open in the off-season. Next, I watched him down a dozen glistening bivalves on the half shell — and then another. He urged me to try one, “juste une!” But it was too much, too soon. My only prior oyster experience featured gagging on the rubbery mollusks in my mom’s milky oyster soup. Let’s just say I’ve come around. And when Bordeaux-based friends and family told me the bay had changed, too, I thought I would investigate. Although it has been over a year since I have been “on the Basin,” as locals say, I have sensed the winds of hipness blowing through the area, especially since French actress Marion Cotillard (of “The Dark Knight Rises” fame) starred in a 2010 romantic comedy called “Little White Lies” set in a local fishing village. There is also La Co(o)rniche, a showy St. Tropez-style boutique hotel, bar, and restaurant perched next to the Pilat Dune, opened two years ago by a former rugby player and designed by Philippe Starck, who has a house on the cape. Since Arcachon is nowhere near St. Tropez (and, by the way, Arcachon Bay’s low-key Cap Ferret is about as similar to the Riviera’s Cap Ferrat as Hermès is to Versace) it caused a bit of a stir among the locals. That said, the view of Cap Ferret from La Co(o)rniche’s happening terrace is, simply, magnificent — if you can stand the strange cocktail of blasé poseurs and gawking visitors. In late June I don’t spot any Russians, but the French are beginning to arrive for their annual summer stay at homes sprinkled among the pine trees. I fit right in because friends have lent me a cozy green-shuttered cottage near Cap Ferret’s jetty. My first order of business is to pump up the bike tires. With only one main road, and draconian zoning laws to preserve the fragile ecosystem from rampant development (the entire oceanfront is a protected area of forests and beaches), biking is definitely the transportation of choice here. Then, I pedal slowly through the village’s web of streets, past the more contemporary-style Hotel des Sables’ bay front terrace, the arched white wooden gate of the 1920s-era Hotel des Pins with its “billiards, bar and restaurant,” and the wisteria-draped Maison du Bassin with its breezy colonial-style cocktail bar. These boutique hotels are among the nicest (and only) places to stay on the cape, each with a different take on refined, beachy art de vivre. There’s also a retro hotel-restaurant a few miles away in L’Herbe, one of the handful of historic villages ostréicoles (oyster villages) along the bay. Built in 1860 as lunchroom and dormitory for forestry workers, the one-story Hotel de la Plage Chez Magne, with its traditional wooden framing and first-floor balcony, hadn’t changed much until a Bordeaux restaurateur gave it a fresh coat of red paint in 2010. For those tired of oysters (imagine that!) tucking into a steak à la bordelaise smothered in sauteed shallots, with a side of home-cut fries and a glass of rouge, is a moment of note. L’Herbe, like the other oyster villages, seems frozen in time: a ramshackle, pedestrian-only jumble of brightly painted cottages and weathered wooden cabins linked by hollyhock-choked sand lanes. Poking around the village, I stumble on the recently restored Algerian Chapel, a quirky Moorish-influenced chapel painted in crimson and white. Sadly, it’s all that remains of the fabulous Arabian-nights-style estate built in 1865 by Léon Lesca, a French entrepreneur who made his fortune in Algeria. Although more than a few modern-day Lescas have managed to weasel their way in, municipal laws state properties in these villages are reserved for those who work the sea. It’s a way of ensuring affordable housing for locals in places where land values have skyrocketed over the past decade. I learn more about oyster production from Agathe Bouin, 24, who, as the employee of a family-owned oyster business in Cap Ferret, has her name on the list for one of the subsidized cabins. When Bouin shows me around her workplace, I tell her I was impressed early that morning when I saw two workers in yellow rain slickers and galoshes working the muddy beds at low tide a few hundred feet outside of the Pinasse Café, another recently spiffed-up local institution near Cap Ferret’s jetty where I was waiting out a downpour over a steaming double espresso. “That was me and my boss!” Bouin says with a pleased grin. “Bringing in today’s order.” Bigger outfits welcome visitors with boat tours of their oyster beds and tastings. There’s also a small museum, La Maison de l’Huitre, at the bay’s main oyster port, Gujan-Mestras. The next morning, I head over to the other side of the bay to visit the town of Arcachon. It’s faster to take the ferry from Cap Ferret, but I drive so I can stop at Le Teich, where the Leyre River forms a saltwater delta. There, in the cul du bassin (politely translated as “the bay’s rear end”), I branch out from oysters to birds at the Teich Ornithological Park. Strolling the well-marked nature trails among reedy marshes and lingering inside the comfy viewing shelters, I speak with Monique, whose camera has a zoom the length of my forearm. “This is one of the best reserves for birding in southern Europe,” she says. As I leave the park, I spot canoe and kayak rental as well. Thirty minutes later, I’m in Arcachon. There, among the hundreds of fabulous Belle Epoque villas on the hilltop Ville d’Hiver (Winter Town), I channel a bygone era by means of the tourist office’s convenient audio guide. At the casino in the Parc Mauresque overlooking the cerulean bay, it was literally dance-till-you-drop for Europe’s sick elite, who believed the pine-scented air and salty sea breezes would cure tuberculosis. In fact, the whole Winter Town architectural pastiche of Swiss chalets, English cottages, Gothic villas, and colonial-inspired residences was launched as a sanitarium village by French tycoons in 1857. Today, most of the villas are privately owned. The tinkle of champagne glasses, strains of French can-can, and clinking of dice have melted away, replaced by the cooing of pigeons, rustle of palms, and droning of bees. The real action is down by the bay front beaches in Arcachon’s modern “Summer Town.” But as I drift off for the night in the posh Hotel Ville d’Hiver (installed in the former Winter City waterworks), I can’t help thinking of the ghosts of Napoleon III, Empress Eugenie, and their crowned Belle Epoque cohorts who partied here. Oh, and they also ate oysters. In fact, Napoleon III named the bay’s first oyster bed concession after his empress. I had read how this area’s 250 plots, sold off by the state in 1908 for, as the French say, “a bite of bread,” are now among the most expensive real estate in France. Taking in the thick forest, dirt paths, cottages half-hidden by masses of pink hydrangeas, and even a beached houseboat on a shady plot overlooking the bay, I realize it takes far more than peanuts to keep a place frozen in time these days. But for François Lafitte, whose great-grandmother founded Chez Hortense, the legendary restaurant on the point, in 1916, it’s all about saving this sandy headland. While his mother embraces recently arrived residents and fields phone calls at their old-fashioned establishment, we step outside.